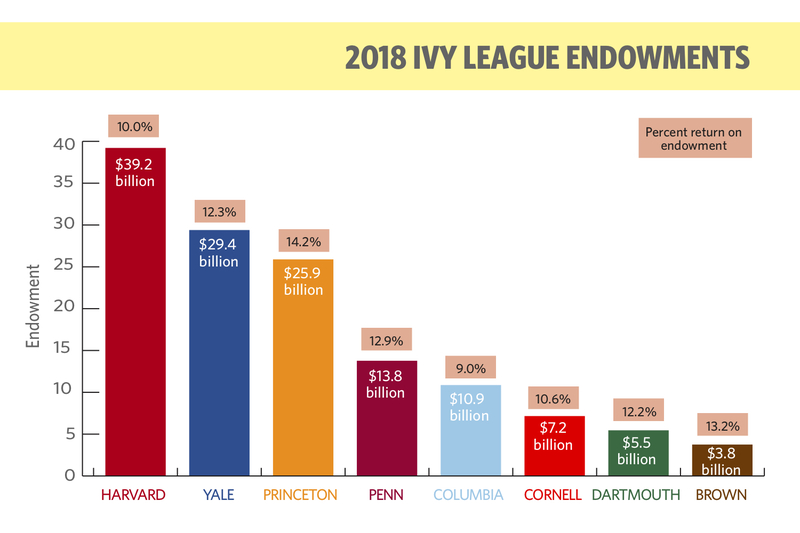 Columbia's endowment remains the fourth-smallest endowment of the Ivy League, behind Harvard, Yale, Princeton, and the University of Pennsylvania. Columbia’s latest endowment report show a 9.0 percent return on investments over the 2018 fiscal year, the smallest number of any of the Ivy League schools during the period, according to a statement released by the University on Wednesday. The University’s endowment, when donations are taken into account, closed at $10.9 billion for the period ending June 30, 2018, having grown by about 8.7 percent over the fiscal period 2017. The statement attributed this increase to substantial gifts from donors, such as the Vagelos family’s $250 million donation that will eliminate outstanding loans for students at the medical school. The endowment remains the fourth-smallest endowment of the Ivy League, behind Harvard, Yale, Princeton, and the University of Pennsylvania. Last year, the endowment generated a return of 13.7 percent, the third-highest return compared to Columbia’s Ivy League peers. This year’s numbers, however, fell short of the University’s asset allocation benchmarks, according the statement. Columbia’s current return rate remains 3.2 percent smaller than the 12.2 percent average of the other seven Ivy League schools, placing it behind Harvard’s 10.0 percent and Cornell’s 10.6. However, Columbia posted an 8 percent trailing ten-year returns, the average annual returns for the past ten years, the highest among its peers. Investment of the endowment is overseen by Peter Holland, the CEO of the Columbia University Investment Management Company. This is the second year since Nirmal Narvekar, who previously oversaw Columbia’s investment strategy, left to run Harvard’s now-$39.2 billion endowment.